Create With Me: Waltzingmouse and Moxie Fab Stamp of Approval! Love your one layer window card! I have so many new things on my list to try after the holidays and this is going on the list. Beautiful card! I love that your NO PEEKING is set inside of a peeking window. Great project and so cleverly executed. Merry Christmas, Julia! How cute and clever Julia!! LOVE the "no peeking" Santa in the cut-out window!! A-D-O-R-A-B-L-E!!! What a lovely card Julia! Love the window with the Santa silhouette peeking through! Happy Holidays! This is wonderful, what a fun card! Love this image o f Santa and the little touch of sparkle! Brilliant! Love your window card, fabulous! Ha, ha--what a cute idea to have the Santa peeking out of a window with the sentiment No Peeking! I like cards that show this wry sense of humor. Very cute! 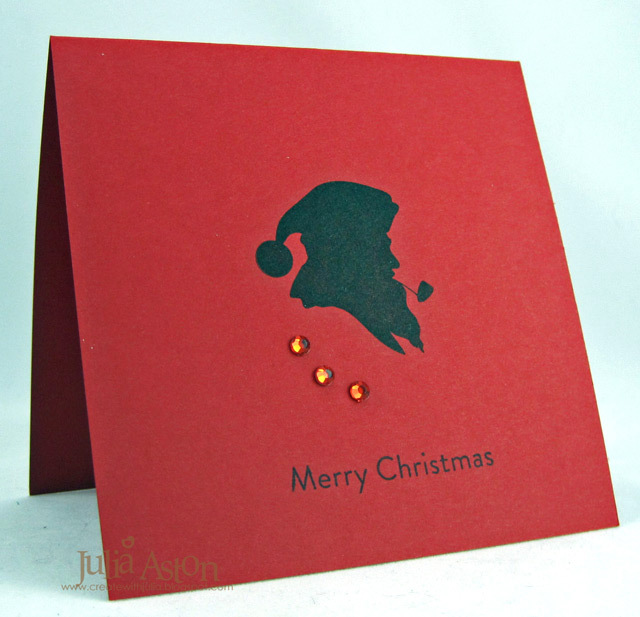 Your cards are wonderful, Julia...the Santa silhouette is one of my favorite Christmas WM stamps and I love how you used the red cardstock!!!! Lovely card Julia and thank you so much for the shout out!!!! and wow! i love your baskets! !